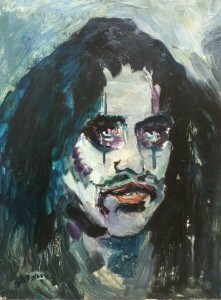 This is a portrait by James Lawrence Isherwood of, Alice Cooper, the famous American rock singer, songwriter and musician, who’s career spans six decades. He is considered by his fans and peers to be “The Godfather Of Shock Rock”. Starting off in Detroit in the 1960′s, he is still going strong today. This painting captures Cooper in his famous overly made up stage makeup. His long black hair hanging in true rock star fashion. The dash of red highlighting his lips. The black, grey, red and a little bit of white is all it takes to make this portrait a fabulous likeness to the rock legend. On the reverse of the work, Isherwood has written the title Alice Cooper Esq, a cross, the price in Guineas and the date the painting was done, 1974. The artist has signed the front of the painting on the bottom left. For anyone looking to add a genuine Isherwood portrait to their collection, or a fan of Alice Cooper looking for something different to hang on their wall, this painting is perfect for either. Isherwood portraits are very popular and this is a great opportunity to acquire a very good example that can be enjoyed by young and old alike.